The holidays are done and gone, and now it's time to get your financial life back in gear—and by that we mean, it's time to make back all the money that you spent on gifts. If you need to put pennies back in your piggy or if you just want to learn how to make a little bit of extra money, check out the list below for some helpful tips. There's nothing worse than not having a budget for yourself. Write down how much you can spend a week on coffee, food, makeup, books, clothes and anything else you might spend your money on. Make sure it's a reasonable amount (aka: not too much) and that you leave a little extra for emergencies...or if something fun comes up. Whether you're old school and like to write with pen and paper or you're all abut that #techlife, keeping track of what you spend is the only way to make sure you're not busting your budget. Create a physical ledger, start a spreadsheet or use an app. We love apps such as Money Tracker+, Digit and Clarity Money. Keeping an eye on your spending throughout the month—rather than just at the end of it when your bank statement rolls in—will allow you to make smarter money decisions. 3. Don't need it? Cut it out! While you're tracking your spending, see if there are things that you don't really need at the moment. Cut down on the amount you eat out (unless you have a gift card, or if a parent or date is offering to pay). It's also smart to buddy up on your Netflix subscription. That way, you and a friend can pay half instead of paying for the whole thing yourself. Don't forget: You can always resubscribe to things or treat yourself every once and a while, but until you get into the habit of spending wisely, try to cut back on things that aren't necessary. If you really can't cut something from your spending, search for discounts. Spotify offers a lower rate for students, as do many restaurants and retail stores, so it never hurts to ask. 4. Put some dough aside. 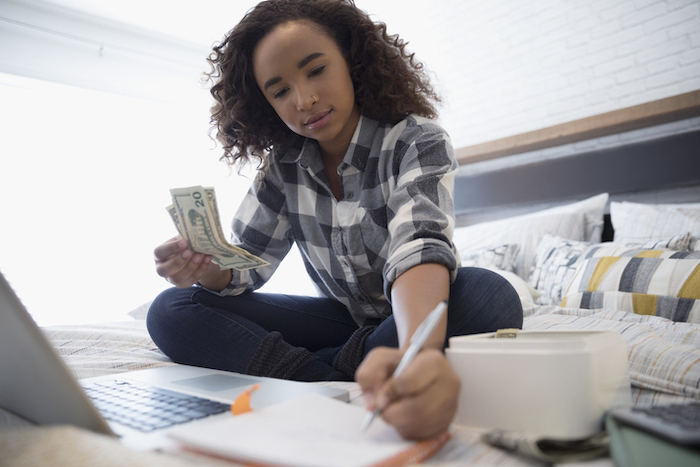 Whether you babysit, have a part-time job or get an allowance from your parents, put a little bit of the total amount aside into a savings account—or even into an envelope that you keep in your sock drawer. Make a note to yourself not to touch the money that you're setting aside until a certain date, and stick to it! Even if you only put $5 every time, that money will grow before you know it. As silly as it seems, every penny counts. When you're walking down the sidewalk or stop at a vending machine, look around for loose coins that are laying around. Pick 'em up and stash your findings in a change jar. Once your rake in enough change, take it to the bank to and deposit it. What are some spending habits you hope to curb? Or saving habits you hope to develop? Tell us below!